This marvellous egg came second in the Good Housekeeping 2019 category for best free-from Easter egg. Dairy, gluten & soya free. No GM. Vegan. Hammy Hamster and her Moo Free friends make delicious dairy free chocolates that taste just like milk chocolate. One day Rosie Rabbit had an idea. Why not try sprinkling some honeycomb pieces into an Easter egg? So, that's exactly what Hammy did and it was bunny-tastically amazing! 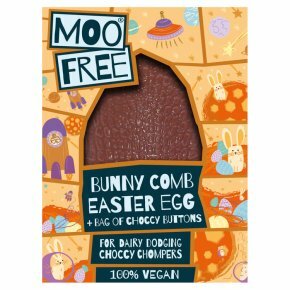 This Easter egg was lovingly made by Moo Free who are an ethical, family-owned UK manufacturer. We only use natural, high quality ingredients including single origin, organic cocoa mass from plantations in the Dominican Republic. We hope the you love this Easter egg as much as we loved making it.